The Waterside Half Marathon, which this year incorporated the N.I. & Ulster Half Marathon Championships, took place on 2nd September with over 1500 runners taking part in the prestigious event. Starting in Ebrington Square the field made their way out the Limavady Road and under the Foyle Bridge, before a lap of Gransha Hospital and onto the A2 to make their way back to the Foyle Bridge, this time to cross the river and run alongside the River Foyle to Coshowen, before turning back to the city and Crossing the Peace Bridge to finish on the running track in St Columbs Park. Although good the weather conditions were just a little short of perfect as the temperature quickly rose and a stiff breeze blew down the river. Springwell RC was well represented at the event with 48 club members participating, either as competitors or assisting as pacers. Ciara Toner, continuing her preparation for the Dublin Marathon, produced another excellent performance to finish 33rd overall and 2nd lady in a time of 1.22.08, taking 1 minute and 25 seconds off her own club record for the distance. 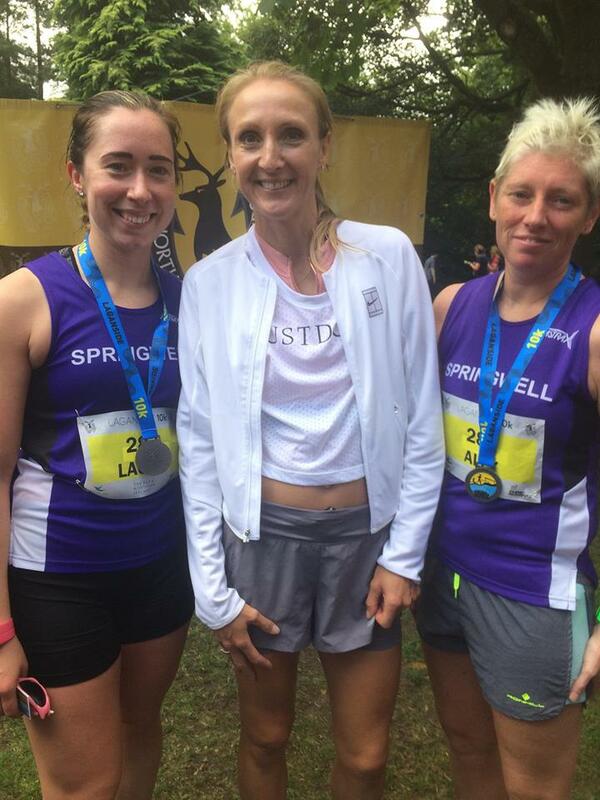 With Ciara leading the Springwell RC lady’s home and club mates Mandy Stewart and Catherine Pinkerton finishing in 1.44.42 and 1.47.59 respectively, their combined efforts saw them being crowned as the N.I. & Ulster Half Marathon Champions 2018. Springwell RC enjoyed further success with age category wins for Bryan Edgar (M55) and Hugh Boyle (M65) and third place finishes in their age categories for Steven McAlary (M35), David Jackson (M50) and Elizabeth Deighan (F55). The Pure Running Laganside 10k took place on Sunday 2nd September in very hot and sunny conditions. The North Belfast Harriers hosted event is part of the Novosco 10k Grand Prix 2018 Series and was all the more memorable this year with the appearance of Marathon World Record holder Paula Radcliffe. The former Sports Personality of the Year took time to speak with fans, support junior runners in their one mile event and complete the 10k in a comfortable 42.35. Now that the summer holidays are over the Fun 2 Run sessions are starting again, with the first this Friday 7th September. Starting at 5.15pm these sessions cater for junior runners from P5 to year 9. New members are welcome on the night. For any further details please contact Alistair on 07711 822208.